MCGS Port Mayaca Cemetery, run by the Pahokee city clerk, Palm Beach Co. The Port Mayaca Memorial Gardens was started in the early 1920’s with 10 acres as the first section. Another section of 5 acres was opened by the mid 1970’s. 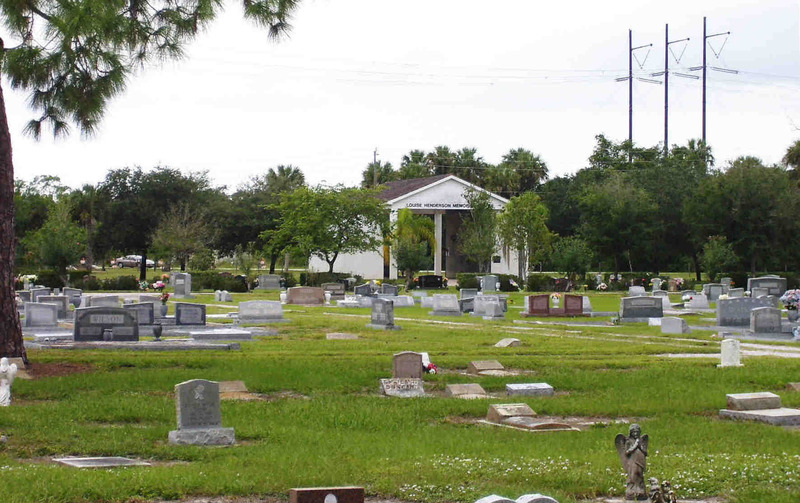 The cemetery is located on Route 76, 8.0 miles west of the intersection with Route 710 near Indiantown and 2.4 miles east of Lake Okeechobee and US Route 98/441. The GPS coordinates are: N 26.59.742 and W080.34.876. Although the cemetery is located in Martin County, the City Clerk’s Office of Pahokee, Palm Beach Co., FL controls the operations. A link to the city’s cemetery webpage is given below. The cemetery is very well taken care of by Arthur Ivester, Director, and it is a serene place to wander through. The cemetery was used for a mass burial, as stated on the memorial stone: IN MEMORIAM: To the 1600 pioneers in this mass burial who gave their lives in the 1928 hurricane so that the glades might be as we know it today. Charter Trustee Members: Walter Ashley, Louis F. Mims, S. J. Fisher. The 1975 book, “History of Martin County”, by Janet Hutchinson, has more information about the cemetery. Additional information is on the City of Pahokee’s webpage. In 1993, $125,000 was donated for the “Louise Henderson Memorial Chapel”, a combination chapel / mausoleum by Vincent Henderson in memory of his wife Louise. After his death, another $875,000 was donated in an endowment for maintaining the cemetery. Link to Palm Beach Post 24 Apr 2013 article. A copy is in the Genealogy Room of the Blake Library, CD's file drawers. Many thanks for the beautiful graphics!! !